It's a mystery why no cyclist has ever chosen to lock her bike to any of these five stands on Courtenay Place E17. 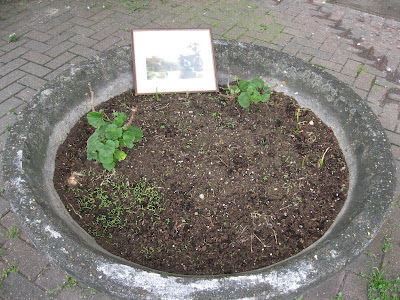 As you can see not only are they beautifully maintained, but they are conveniently situated close to a rat-infested alley that leads to a car park and an industrial estate. This quiet, delightful out-of-the-way location is the perfect place to test your D lock against the efforts of bicycle thieves. But do take care if lumberjacks are in the vicinity. Saturday. 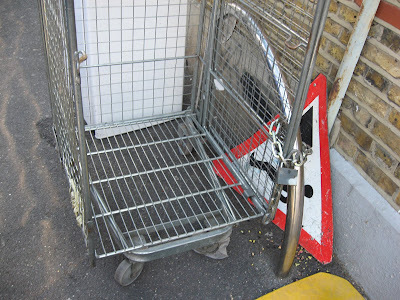 Above: a market trader has padlocked his cart to the cycle stand on Truro Road E17, by the corner with Walthamstow High Street. 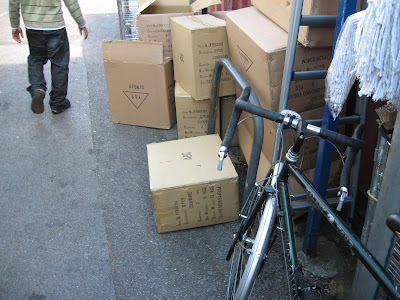 Below: spot the second cycle stand. Corner of Westbury Road E17 and Walthamstow High Street. 164 Hoe Street E17. Yesterday. 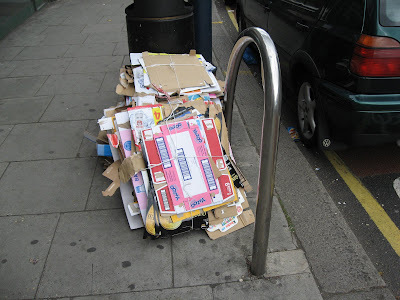 This cycle stand attracts rubbish seven days a week. 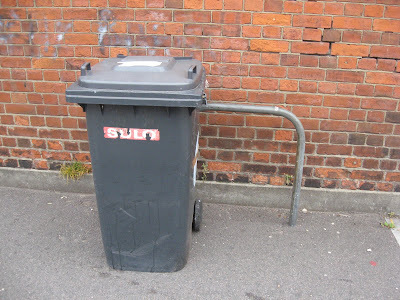 It would help to move that 'Quality Environment' rubbish bin somewhere else. Campaigners have declared a "crisis" on our streets after a woman became the fifth cyclist to die in collision with a lorry in just two years. Lucinda Ferrier, 32, was struck by the heavy goods vehicle in Stoke Newington at 6.40am on Monday. An air ambulance rushed Ms Ferrier to the Royal London Hospital in Whitechapel. She died shortly afterwards. "This is a crisis and I am stunned by the frequency of these collisions," said Trevor Parsons, a co-ordinator with the London Cycling Campaign in Hackney. "It's time for Hackney in particular to set up a task force to look at this issue because the rate of these collisions is absolutely shocking. "We would like to see measures to minimise the amount of HGV traffic on the road and better trained drivers and better paid drivers, so they are under less pressure and can spend more time and care on our streets." It appears she slipped on a poor patch of road surface, clipped the curb just outside Stoke Newington and was then struck by the heavy good vehicle. Police believe she was travelling south down Stoke Newington High Street alongside the vehicle when she was hit and then pulled underneath. 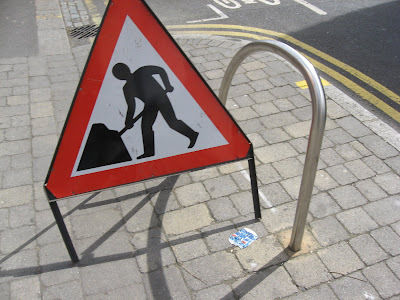 According to a post on cycling website 'movingtargetzine' council workers were busy resurfacing the area outside the train station late Monday night. 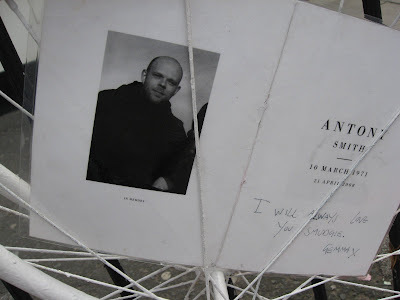 I was cycling along Middleton Road in Hackney recently when at the junction with Kingsland Road I suddenly came upon the ghost cycle put up in memory of Antony Smith, who was crushed to death here on 21 April. This is the first ghost cycle I’ve come across, and it struck me as being stunningly effective. 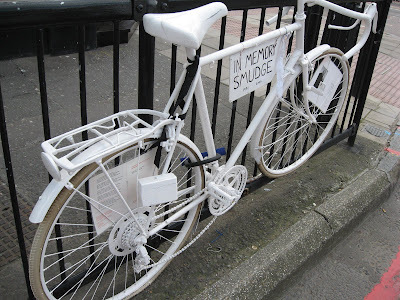 It’s a great pity that there are no ghost cycles in Waltham Forest, not least for commuter cyclist Michael McLean who was killed by a high-speed hit and run driver on Forest Road E17 last year (the killer driver seems never to have been traced). At the site where Michael McLean died, drivers continue to break the speed limit with impunity, and the Council has re-designed the cycle lane on the opposite side to accommodate lazy car parkers, in the process making cycling more dangerous. What strikes me about the site where Antony Smith died is just how poorly designed this junction is. This is a major cross town cycling commuter route but there is no dedicated cycle crossing with a green phase for cyclists only. The ASL is pathetically small and inadequate. The railings on the corner provide the classic trap for cyclists who find a large vehicle suddenly veering towards them. And while I was taking photographs a whole series of vehicles came along and stopped in the ASL, displaying the characteristically casual contempt of many drivers both for road traffic law and for dedicated cycling facilities. Nationally, the situation is rather different. The latest figures from the Department for Transport show that the overall number of cycle trips has fallen slightly, down from an average of 17 trips per person in 2000 to 16 in 2006. The number of people killed on British roads last year fell to the lowest level since records began, it was announced today. However the number of motorcyclists killed or seriously injured rose 4per cent to 6,737, while the total casualty figure of 23,459 was 1per cent up. Total fatalities in 2007 were 2,943 - 7per cent lower than in 2006, with deaths and serious injuries down in all categories of road user except motorcyclists. The number of children killed or seriously injured in 2007 was 3,090 - a 6per cent fall. A cyclist who suffered permanent brain injuries after a bike accident has accused Boris Johnson of setting a bad example by failing to wear a helmet. Father-of-two Simon Turner, 41, spent three days in intensive care and doctors warned his wife Michele that he might not survive the injuries he sustained in the fall in Richmond Park. Two years later, he has metal plates in his head, permanent pain, fatigue and tinnitus, and has lost his sense of smell, taste and the hearing in one ear as a result of the accident. He called on the Mayor to ensure he always wore a helmet when cycling in London. Bicyclists who wear protective helmets are more likely to be struck by passing vehicles, research suggests. Drivers pass closer when overtaking cyclists wearing helmets than when overtaking bare-headed cyclists, increasing the risk of a collision, the research has found. Dr Ian Walker, a traffic psychologist from the University of Bath, used a bicycle fitted with a computer and an ultrasonic distance sensor to record data from over 2,500 overtaking motorists in Salisbury and Bristol. Cyclists in central London can expect to be cut up by an exciting new style of taxi: The Mercedes-Benz Vito has sliding doors, electric steps and seating for six people. The familiar TX4, made by London Taxis International, seats five. Television presenter Patrick Kielty has been fined for speeding at 101mph. His lawyer, Gerald Tierney, said Kielty normally flew and was therefore unfamiliar with the road. "Having had a busy day working in London, his concentration slipped. An error of judgment occurred," Mr Tierney said. Mr Tierney argued that Kielty's charity work, encompassing high profile events and smaller fundraisers such as golf tournaments, would suffer he if was disqualified from driving. Sheriff Thomas Millar said he had taken this into account when deciding to impose a fine. Richmond, of Oakwood, Derby, an HGV driver for 25 years, caused carnage when his lorry slammed into the queue of traffic on the A631 at Corringham, near Gainsborough, Lincs. The court was told that he was "oblivious to all around him" because of the 23-minute call to his mother and did not even apply the brakes of his Scania HGV before ploughing into the traffic. Mr Buston, a 36-year-old married father-of-two, was killed outright, his brother-in-law Peter Long, who was in a Transit van with him, was badly injured, and the driver of the lorry at the front of the queue, Andrejz Matkowski, lost both arms. Roger Vincent, a spokesman for RoSPA, urged the government to impose a blanket ban on making phone calls whilst driving, saying the current laws banning the use of hand-held mobiles failed the address the issue. The Department of Transport's official stance making hands-free phone calls is that they are a "distraction" and should be avoided. But the government-funded Transport Research Laboratory has found that even hands-free phone calls make drivers four times more likely to have an accident, with concentration levels reduced for 10 minutes after the call has ended. The research also showed that drivers making hands-free calls had slower reaction times than those who were slightly over the drink-drive limit. The town of Bohmte, near Hanover, received a £1.8m European Union grant to remove all its traffic lights and warning signs. The 13,000 drivers who use the town each day now have only two road traffic rules to stick to - do not exceed the 30mph speed limit and always give way to the right, whether it is a car, bike or pedestrian. The local council has hailed the experiment a success as not a single traffic accident was reported last month, compared to at least one serious crash every week before the change. A pioneering scheme that rewards owners of electric vehicles with free parking is being scrapped - because it works too well. Since 2001, the City of London has issued free roadside parking passes to nearly 500 drivers of the zero-emission cars in a bid to encourage other people to buy one. It has also handed out 539 permits for free parking in its car parks. But both schemes are being axed or scaled down, because commuters are adding to congestion by using the cars instead of walking, cycling or travelling by public transport. James Hansen, one of the world's leading climate scientists, wants the chief executives of large fossil fuel companies to be put on trial for high crimes against humanity and nature, accusing them of actively spreading doubt about global warming in the same way that tobacco companies blurred the links between smoking and cancer. Hansen will use the symbolically charged 20th anniversary of his groundbreaking speech to the US Congress - in which he was among the first to sound the alarm over the reality of global warming - to argue that radical steps need to be taken immediately if the "perfect storm" of irreversible climate change is not to become inevitable. Speaking before Congress again, he will accuse the chief executive officers of companies such as ExxonMobil and Peabody Energy of being fully aware of the disinformation about climate change they are spreading. Passengers face acute overcrowding on key railway routes because capacity will be exhausted many years before any new lines could be built, according to Network Rail. Residents living near the venue for the Wimbledon Championships have been copying and selling parking permits to tennis fans on the internet. Wandsworth Council issued the permits to homes near the All England Club to allow friends and family to park in restricted areas during the tournament. But the council had to issue new ones after it discovered some residents had made numerous copies of the passes. One was selling 17 passes on eBay and another was asking for £60 for a pair. Crime! Violence! 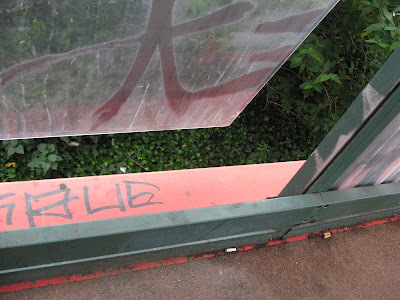 Anti-social behaviour! How about this for anti-cycling prejudice? Eighteen police officers have been disciplined for joking about crashing cars and injuring pedestrians on a social networking website.The officers posted photos of crashes with comments on a group on Facebook called Look, I've had a pocol – slang for a police collision. The group had more than 200 members before it was disbanded in January and an internal inquiry launched. More than 30 pictures were posted on the Facebook site, on which the officers made light of writing off their vehicles and putting members of the public in danger. Fourteen of the officers have been given written warnings and another four received "words of advice". Six people were hurt when a marked police car collided with a taxi in Sunderland. Driving bans will apply throughout the UK and the Republic of Ireland from next spring. Irish, British and Northern Ireland ministers announced the arrangement following a meeting in Belfast. It means that Irish drivers disqualified for an offence in the UK will no longer escape that punishment when they return home, and vice-versa. 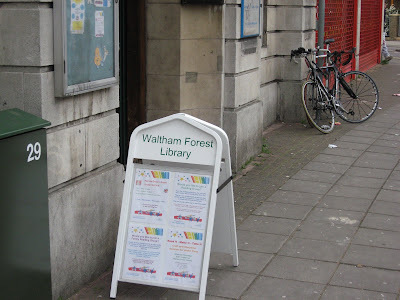 Harrow Green library is one of the libraries in the London Borough of Waltham Forest which lack cycle parking. 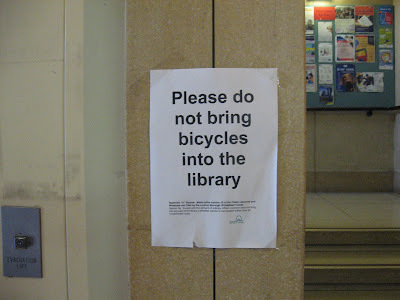 Scandalously, some cyclists have been leaving their bikes in the spacious downstairs porch. These miscreants just haven't got the message, have they? If you want to travel around and use the facilities in this borough, get a car. 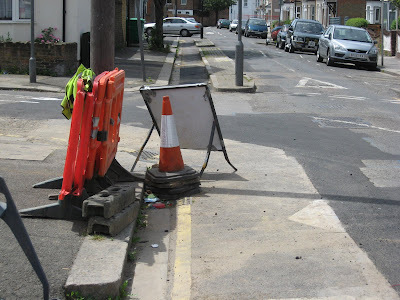 Waltham Forest - the 'Green' council that hands over most of the pavement to motor vehicles in defiance of national minimum standards for meeting the needs of pedestrians with a mobility handicap. 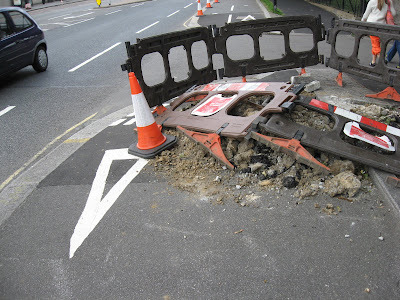 Putting vehicles on pavements clears the road for speeding. 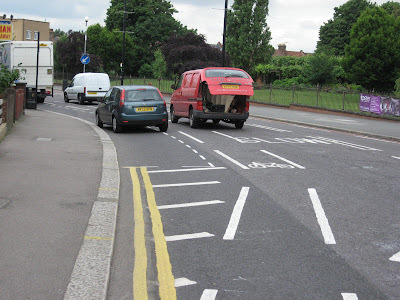 Then the Council paints SLOW next to the pavement-parked vehicles (you can just see the 'S'). If vehicles were parked fully in the carriageway and not on the pavement drivers would be forced to slow down. This is also right by a school, in a road with five schools on it or near to it. 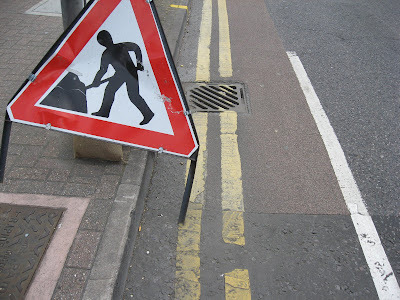 The council promoted the launch of its new street cleaning contract with Kier, promising tax-payers tidier streets because Kier's performance is measured on the cleanliness of streets and grounds rather than the frequency of cleaning. 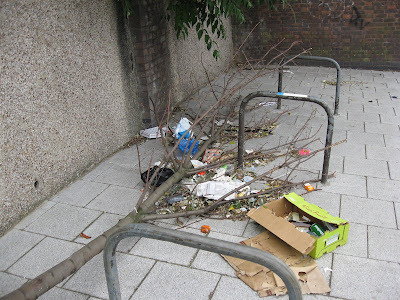 However since the new contractors started earlier this month, some residents say they have not lived up to expectations and there has been more litter. 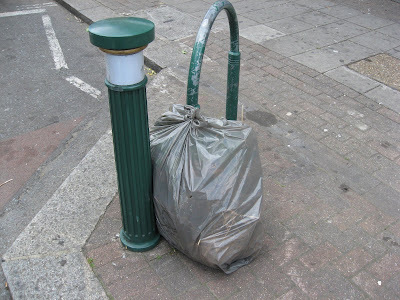 The contract workers continue to dump LBWF street sweepings sacks by cycle stands for collection (below) - something I have blogged about many times before. 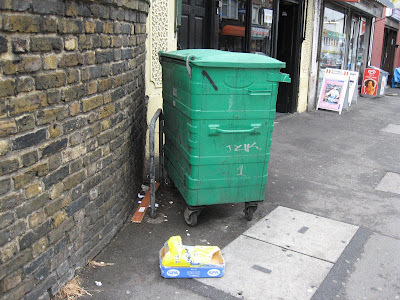 Outside 589 Leytonstone High Road. Yesterday. 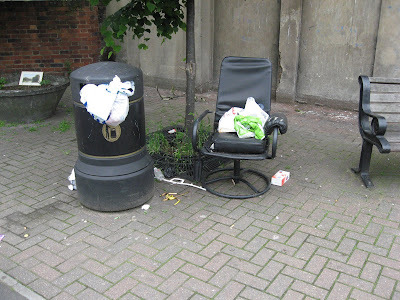 The inconsiderate contractors scheme is now fully operational across the London Borough of Waltham Forest. 'NO ENTRY' one-way street with contraflow lane for cyclists directly ahead. Queen Elizabeth Road E17. 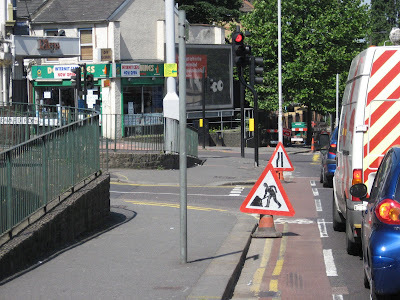 There are no less than four contractors's signs in the cycle lane on High Road Leyton after the junction with Leyton Green Road. Here's two of them. All photographs taken yesterday. These are the lights for cyclists on Maude Road E17, at the cyclists-only signalled crossing which cuts across busy Blackhorse Road to link up with Glenthorne Road. 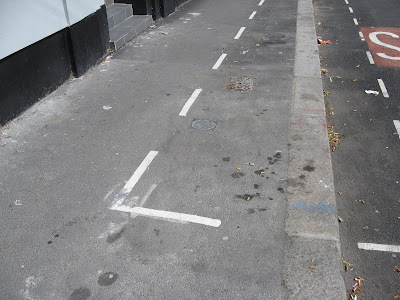 Another superbly maintained facility in London's leading borough for cycling. 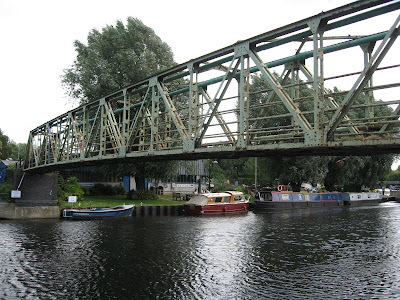 Highbridge Footbridge is a pedestrian/cycle bridge over the River Lea on the Borough boundary with Hackney. 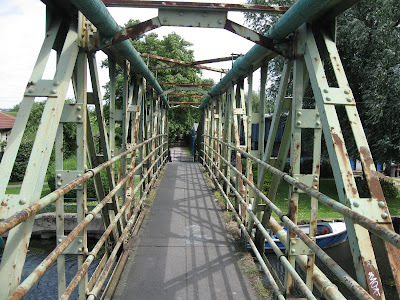 The bridge is adjacent to the Springfield Marina and is reached from a footway/cycle route that links up to Coppermill Lane. On the Hackney side of the river, the bridge leads to Spring Hill. The bridge is part of the national cycle route network. similar but not identical to the existing structure. It would have the same span, but would be wider with a clear internal width of 2 metres, as compared to 1.4 metres width on the existing structure. The new bridge would also be open at the top, without the cross bracing members seen at the top of the existing bridge. It sounds alright to me, but then I don't know anything about bridges and the published Planning Committee papers don't include a plan or drawing of the proposed replacement bridge. What bothers me is that the Council hasn't bothered to consult anyone who uses the bridge or who has an interest in cycling or walking. The only consultees were the London Borough of Hackney, British Waterways, the Environment Agency and the Lee Valley Regional Park Authority. Not one of them bothered to respond. The Council didn't bother to consult the London Cycling Campaign or either of its two local branches, in Waltham Forest and Hackney. It didn't bother to consult walking organisations like the Ramblers' Association or Living Streets. It didn't bother to consult the local Civic Society, which has an interest in architecture. 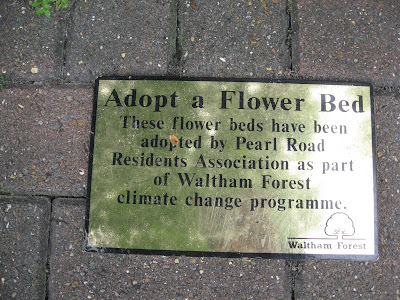 It didn't bother to consult local Green organisations, such as the Lammas Lands campaign. All of these groups should have been consulted to see if they liked the new design or had any constructive suggestions. This Council, which always makes a big deal out of pretending to care what the local community thinks, simply couldn't be bothered. What do the opinions of cycling, walking and Green organisations matter? The Council planners know best. Down memory lane... 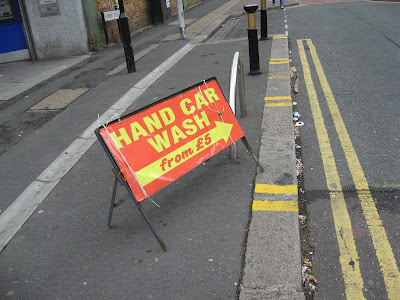 Ten months ago the very first post on this blog, complained about the permanent obstruction of this cycle stand on Bromley Road, by a car wash firm which had padlocked this sign to it. 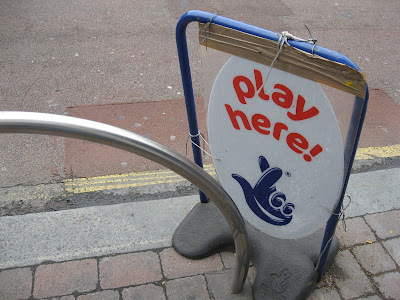 The sign was subsequently removed and that seemed to be the end of the problem. But now after a long absence the sign is back, every day. Which is what happens when the council's environmental inspectorate just talks nicely to local businesses instead of prosecuting them. 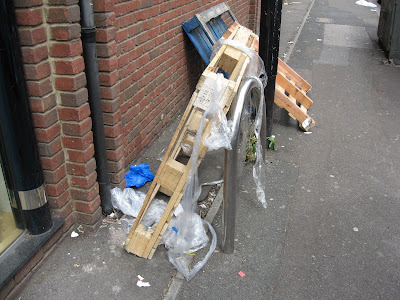 This photo was taken on Saturday, along with all the other obstructed cycle stands shown below. 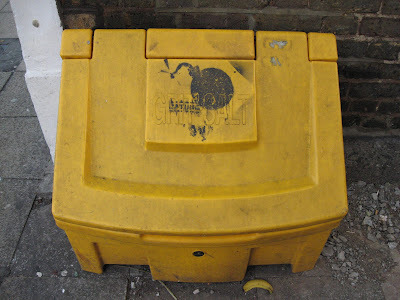 (Below) See if you can spot the Sheffield stand outside number 450 High Road Leyton. 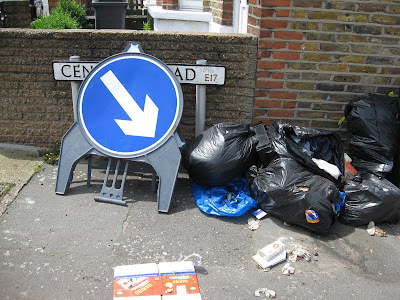 I've blogged about this twice before and this crap Council has done precisely nothing. 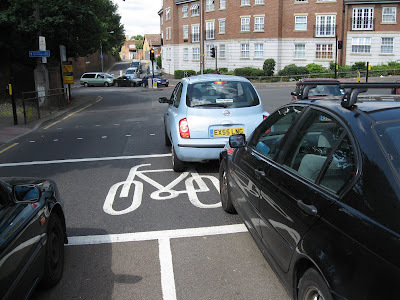 On Warren Road E10 (below) a cyclist has managed to squeeze in, despite that road contractor's sign. Well done! "It's happening here - and you are in the front row"
The bench shown here is supposed to be in a pedestrian zone. But these days anyone drives into the Town Square and parks, knowing full well that no one gives a damn. Some drivers use the Town Square as a short cut. Market traders belt through it at speed at the end of market day. Other drivers have realised that it's a great place for free parking. Nothing will be done until a child gets run down and injured or killed in what is laughably supposed to be a pedestrianised area. The Town Square today was full of vibrant activity. I picked up a lavishly produced Council PR document about the Olympic Games entitled It's happening here and you are in the front row. It was the usual empty PR garbage: We want to get more people walking and cycling to help reduce their own and Waltham Forest's carbon footprint. 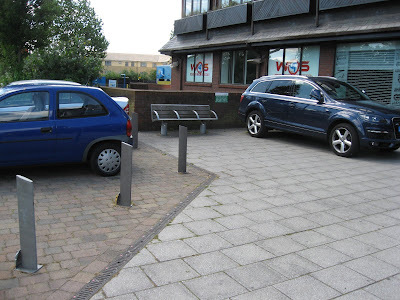 Which is pretty rich from a Council which continues to convert pavements for 4X4 parking, even when it breaches national minimum guidelines on the needs of pedestrians with a mobility handicap. Ironically while I was glancing at this crap document a couple of dodgy characters who I assume were in the scrap metal business proceeded to apprise the bollards shown in my pic. 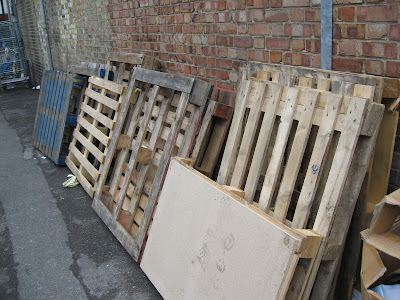 Having decided on what they wanted to steal they calmly loaded various bollards and accessories into their ageing Commer-style van and drove out of the Town Square at 11.35 am, turning left towards Walthamstow Central. They spent about 15 minutes deciding what to steal, so I guess they should have been picked up by all the CCTV in the area. That's if it was pointing in the right direction and anyone was bothering to notice. This is what happens if you don't bother restricting access to a supposedly dedicated pedestrian zone. You even make life easier for motorized thieves. 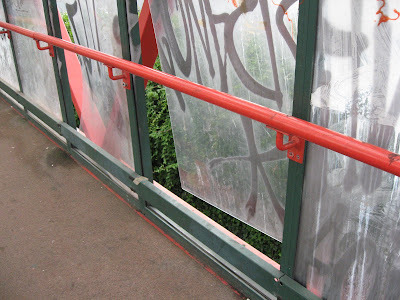 And while on the subject of hazardous pedestrian areas, let me mention the grisly plastic walkway over the M11 Link Road, by Leytonstone tube station. Crossing it yesterday I noticed that two of the plastic panels were loose. One of them had a gap big enough for a child to plunge through. 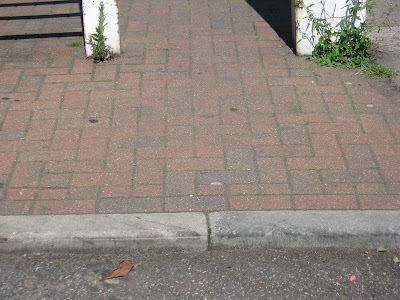 The more this Council blathers about getting people to walk, the crappier the walking environment gets. The majority of the British public is still not convinced that climate change is caused by humans - and many others believe scientists are exaggerating the problem, according to an exclusive poll for The Observer. The poll results have shocked campaigners who hoped that doubts would have been silenced by a report last year by more than 2,500 scientists for the UN Intergovernmental Panel on Climate Change (IPCC), which found a 90 per cent chance that humans were the main cause of climate change and warned that drastic action was needed to cut greenhouse gas emissions. More than half of those polled did not have confidence in international or British political leaders to tackle climate change. A group of MPs has criticised the Government for failing to reduce potentially deadly air pollution in London. The Commons transport committee singled out the capital's poor record on meeting targets in a report. It found that targets for nitrogen dioxide, sulphur dioxide and particulates (PM10s) were all missed and in some cases levels were actually rising. The report, based on 2006 readings, found the worst areas included King's Cross, Bloomsbury, Holborn and large swathes of the West End. "The consequences of this failure are not insignificant ... it is estimated that respiratory disorders associated with PM10 episodes are responsible for 8,100 additional deaths and 10,500 additional hospital admissions each year." The pressure is on Alistair Darling to scrap the 2p rise in fuel duty scheduled for this October and to U-turn on the plan to increase the road tax on gaz-guzzlers. Green politics matter now more than ever. It is not woolly to be green at this time. It has never been more hard-headed. The crisis over the oil price is just one of many indicators that it is even more imperative to wean ourselves off fossil fuels and make the radical moves necessary to become a low-carbon economy. The fortunate countries of the future will be those with political and business leaders with the foresight to plan for that world by encouraging investment in clean and renewable energies, carbon capture and green transport. Bristol was appointed as the UK's first official Cycling City by Transport Secretary Ruth Kelly. Eleven other urban areas have been designated Cycling Demonstration Towns in an attempt to encourage 2.5 million more people to take up cycling, improve their fitness and beat the traffic. However, “You get cut-up, you get abuse” – see the cycling video here. 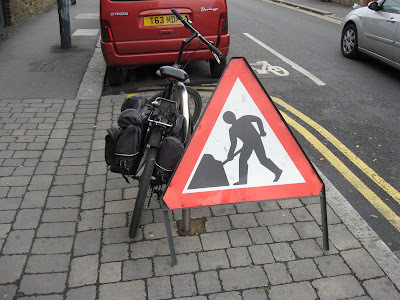 And more about cycling in Bristol here. As soon as I started to wear a helmet, I was denounced as a wimp, a milquetoast, a sell-out to the elf and safety lobby, a man so cravenly attached to his own survival that he was willing to wear this undignified plastic hat. As soon as I was pictured not wearing a helmet, I was attacked for "sending out the wrong signal" and generally poisoning the minds of the young with my own reckless behaviour. More than half a million journeys on London's major roads are made by cyclists each day. The figure represents a 91% rise in cycle journeys on the city's major roads since TfL was created in 2000. In the 12 months to March 2008, cycling on major roads grew by 4.5%, with about 20,500 more cycle journeys every day. The parents of a woman who died after a collision between a car and a police van answering an emergency call have paid tribute to their daughter. Angela Purcell, 38, was in a Seat Ibiza which collided with the vehicle in Patricroft, Salford, on Friday. Her five-year-old niece and the male driver were also injured and are being treated in Hope Hospital, Salford. IT IS with great disappointment that my first public act as the newly appointed City of York Cycling Champion is to condemn those who intend to participate in the Naked Cycle Ride. One of my key objectives for my champion year is to encourage the police to prosecute those cyclists who give us a bad name by cycling illegally on pavements, ride at night without lights and who ignore traffic lights. What message on respect for the law and other people does riding naked through our city send out? Can they not understand double standards? Councillor Joe Watt, CYC Cycling Champion, Skelton, York. Yes, June is the month when cyclists all over the U.K. enjoy a popular new form of campaigning: the naked bike ride. The purpose of the rides is to protest car dependency, emphasize the vulnerability of cyclists and celebrate the human body. The biggest rides are in Brighton and London. Most take place with the co-operation of the local police. One that doesn’t is in Edinburgh. The first attempted naked bike ride in Edinburgh was in 2004 and was halted by police, who threatened to arrest anyone who didn’t put their clothes back on. There have been no rides in Edinburgh since, but on Sunday 29 June there will be another attempt. It will be interesting to see if the Edinburgh police adopt the same aggressive attitude as before or this time let it happen. In York there was a good reply to the anti-naked cycling hysteria here. Should people have the right to cycle naked through the streets of York? As the paper quipped, the ride gave a whole new meaning to York's Exhibition Square. In the event 89 cyclists and a dog in a trailer did the ride. Bravo! The national web page of the naked bike ride can be found here. ...I encountered the usual crap. 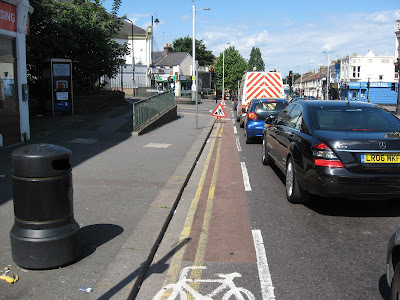 Westbury Road E17 (above), Pretoria Avenue E17 (below), both cycle stands just metres from Walthamstow High Street. 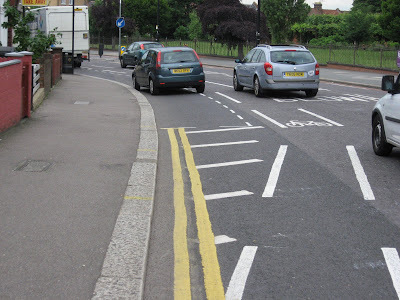 Since I first blogged last August about this crap, dangerous new cycle lane on Forest Road opposite the William Morris Gallery, the Council responded by extending the double-yellow line, so that in theory the start of the lane won’t get obstructed by parking. It’s not much of an improvement. Drivers still belt along here at speeds in excess of 30 mph, and the bend in the road ensures that many vehicles drift into the cycle lane as a matter of course. Some of the lane has been coated in pink, but not all, which is characteristic of the widespread inconsistency of cycle facility provision. 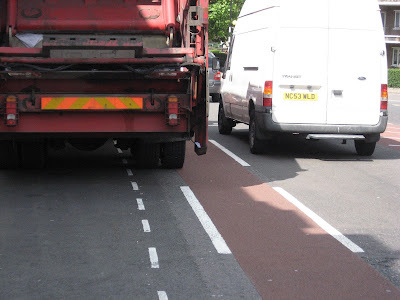 When large vehicles park in the new parking bays, cyclists get squeezed out. The crew of this refuse lorry (below) had evidently gone off for a cup of tea as they were nowhere around and the vehicle was empty. The criticism remains. The council has put parking before cycle safety. The problem of lawless speeding continues not to be addressed. And if you get ‘doored’ here when being overtaken, you’ll probably snuff it. The statistic above would be even bigger if St James Street library was included, because it had no cycle stand provision, even though there’s a very wide pavement right outside it. 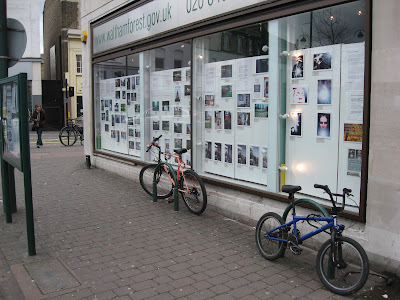 Of the ten libraries in the borough, four have no cycle stands at all. They are: Lea Bridge Road library, Wood Street, Higham Hill and Harrow Green. That's an interesting statistic to reflect upon in National Bike Week. 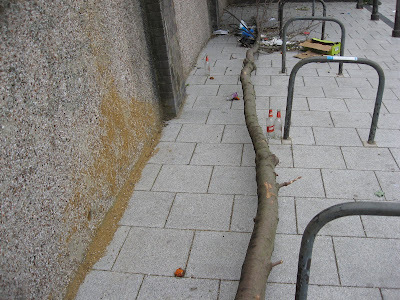 Twenty years after the great Waltham Forest GREEN CHARTER, and after all these years of having a cycling officer, the provision of cycle parking in the borough remains patchy and incoherent. 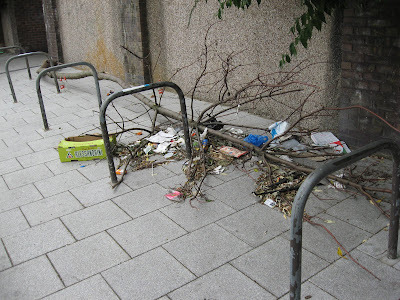 Numerous other buildings owned by the Council and used by the public have no cycle parking. In a central location in a busy shopping area Leytonstone library (below) has just three stands. All in use. The cycle exit on the Brookscroft Road side of the barrier. Brookscroft Road E17 is blocked off with a gate at the junction with Kitchener Road, to stop rat-running between the A112 and the B160. But two lanes are provided either side of the gate, allowing access for cyclists. 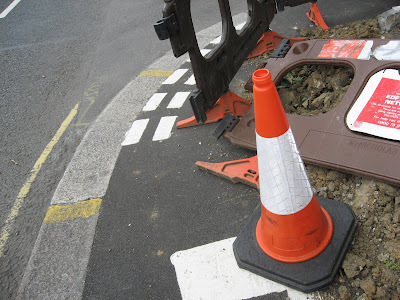 The barrier is on a raised section of carriageway but the entry to each of the cycling lanes incorporates drop kerbs, to ensure a smooth passage. But as you exit either of the cycle lanes you find yourself going over a kerb. This sudden, unexpected jolt guarantees that the inattentive cyclist will experience a shock of surprise. Plainly this magnificent safety device has been specially engineered to combat the well-known danger of “falling asleep at the handlebars”. 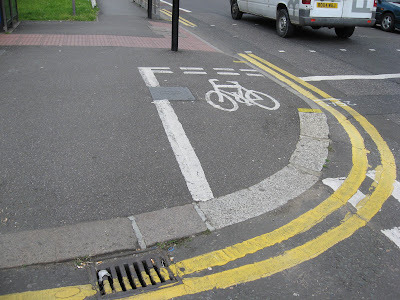 As always, Waltham Forest is at the cutting edge of the very latest in cycling design. Well done, everyone! No more 'dismounting and having to walk' misery for cyclists wishing to press the button on this signalised pedestrian crossing on Forest Road at the junction with Pretoria Avenue E17. And cyclists approaching from the left along Pretoria Avenue can test their proficiency with that ninety-degree turn. Cycling west along Forest Road yesterday I approached the notorious Bell Corner. And up ahead I spotted this. There were roadworks the other side of the junction. 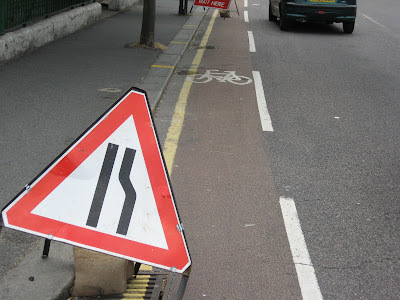 So to give drivers advance warning of two lanes reduced to one, the contractors had put two signs in the cycle lane. 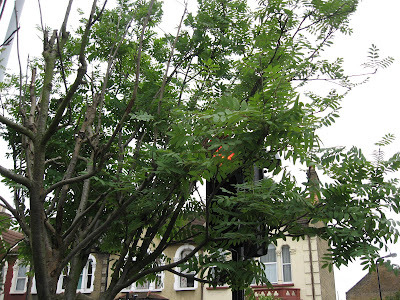 The lights were at red when I took this picture yesterday on Selborne Road E17 at the junction with Willow Walk. The first day of National Bike Week. I wanted to turn right. So did the drivers in the ASL. 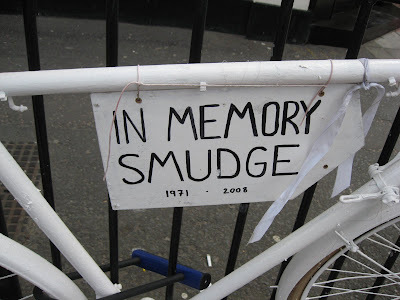 Surveys always say that a lot of people refuse to take up cycling in London on the grounds that "it's too dangerous". And they are right. 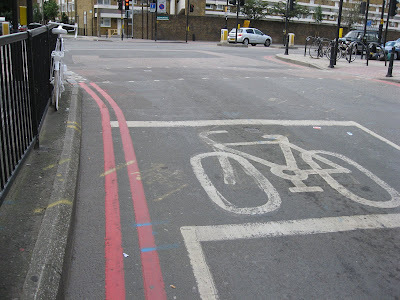 The roads are full of drivers who are contemptuous of road traffic law and decline to respect even the most rudimentary facilities for cyclists, such as Advanced Stop Lines. There is a way of dealing with situations like this. A chunky fine for any driver who enters an ASL when traffic lights are at red. But of course the Brown government, like all governments before it, is in thrall to the road lobby and not seriously interested in promoting cycling, walking or road danger reduction. Yes, they need blowing up. 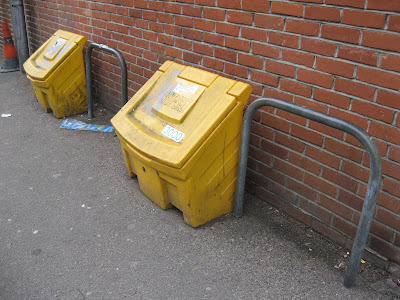 The Council's yellow grit bins, which serve no purpose at all, not even in winter. 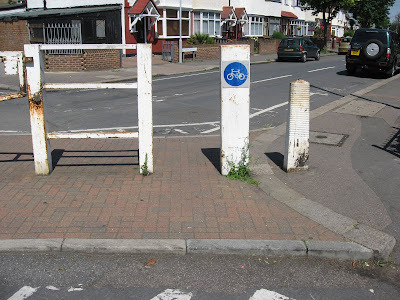 The pair on Erskine Road E17 (below) do a very good job of obstructing the cycle stands. But then no one involved in cycle stand provision and maintenance in this borough seems to understand the need to provide space around Sheffield stands. Vinnie Carta, 21, from Enfield, a third-year physics student at Cambridge University, was in collision with a car near his student digs as he rode to his part-time job as a children's maths tutor last November. He suffered massive head injuries, even though he was wearing a helmet, and died in hospital the following day, with his parents at his bedside. No charges were brought against the driver, who was found to have been doing 48mph inside a 60mph zone, and an inquest recorded a narrative verdict that Vinnie's death was an accident. LCC's chief executive Koy Thomson said: "While we would support measures to make motorcycling safer, such as a 20mph speed limit, there is no clear environmental, safety or congestion reason for allowing motorcycles into bus lanes." Tom Bogdanowicz, LCC's campaigns manager, added: "Providing new, high-speed channels for motorcycles along major roads will inevitably increase motorcycle use. "More motorcycle traffic will spread to all streets in London and will bring with it an increase in casualties for vulnerable road users. We're asking our supporters to urge the Mayor to consider the safety impact on all London streets for every road user before any decision on allowing high-speed vehicles into bus lanes is made." A spokesman for Mr Johnson said he stood by his decision and the scheme would be rolled out in due course. Nationally, cyclists are three times more likely to killed in collisions with motorcyclists than with cars, and twice as likely to be seriously injured. Figures for these cyclist deaths in London aren't available but those for pedestrians are similar to the national picture - they're proportionately three times more likely to be killed or seriously injured by a motorcyclist than by a car. In 2004, that left 114 pedestrians dead or badly injured. Congestion in London could be cut significantly by allowing car-sharers to use bus lanes, it has been claimed. Terry Neville, Enfield cabinet member for the environment, called on the Mayor to consider the idea as a matter of urgency. He said: "This will get London moving again. Congestion is choking London - both environmentally and economically. Bus lanes need to be used more effectively. By allowing people who car-share to use bus lanes we are making the most of London's road space and at the same time helping the economy." Mr Neville also announced that Enfield would refuse to install any more "bus boarders" - bus stops that stickout into the road, preventing other vehicles getting past stationary buses and causing traffic jams. There are four in Green Lanes, a major route running through the borough. The council says the stops cause severe delays. If current policy continues to fail - along the lines of the "agree and ignore" scenario - then 50% to 80% of all species on earth could be driven to extinction by the magnitude and rapidity of warming, and much of the planet's surface left uninhabitable to humans. Billions, not millions, of people would be displaced. Argues Mark Lynas. Emissions of greenhouse gases are currently running at twice that which the Earth can naturally absorb. To stabilise the climate, emissions will have to be halved, the statement says, adding: "Immediate, large-scale mitigation is required." A criminal who walked free from court for dangerous driving offences, killed a mother just two months later as he raced down a street at around 100mph. A police officer who attended the scene of the crash said it was the worst carnage he had seen since the IRA bombing in Manchester. The 63-year-old, who has not been named, was pronounced dead at the scene after the accident on Seymour Street, near Marble Arch at 9.40pm. Last month 23-year-old estate agent Emily Diamond was killed by a falling branch after a double decker bus hit an overhanging tree in Tower Bridge Road. In February pedestrian Carl Forshaw, 30, died after being hit by a No 15 double decker on Praed Street, near Paddington Station. In January Eileen Daley, 58, of Shepherd's Bush, was killed crossing the A4 in Chiswick when she was hit by a car and thrown into the path of a bus. In the same month three teenagers died when their car collided with a bendy bus in Charlton. Last October young father Lee Beckwith, 21, was killed when he slipped under a No 25 bendy bus and was dragged for a mile along Ilford High Road. His father, Paul, called for bendy buses to be withdrawn. Former Premier League footballer and BBC pundit Steve Claridge has been given a suspended jail term and banned from driving after speeding at 100mph. Claridge, 42, was convicted last month of dangerous driving after speeding in "treacherous" conditions on the M42 near Solihull, West Midlands, in 2006. His six-month jail sentence was suspended for two years and he was banned from driving for 12 months. Following the verdict, the court heard that Claridge, who now works as a football pundit on BBC Five Live, already had nine points on his driving licence. Outside court, he said: "I'm pleased with the way things have worked out." A man who died in a Hampshire road crash was a three times 4x4 off-road British Rally Champion. Paul Choat, 43, died when his Mercedes convertible collided with a telegraph pole and a tree on the A338 at Blashford, near Ringwood, on Saturday. In London, they exempt motorists from the capital's congestion charge, a concession worth about £2,000 on its own, before parking is taken into account. This has led to a flourishing black market in the badges, members of the all-party Transport Select Committee have been told. It is understood that blue badges have been put up for sale on Ebay. The number of disabled badges has soared. In 1987 there were only 673,000 in circulation, equivalent to 14 per 1,000 people. By last year this had risen to 2.3 million or 46 badges for every 1,000 people and it is anticipated that there will be more than three million registered disabled motorists by 2012. THE Evening News has reported that up to 70 per cent of the city's 18,577 blue badges are being misused and that there were five successful prosecutions last year. MORE than 100 disabled parking badges were cancelled by a North Wales council after a fraud crackdown revealed the registered owners were dead. One of the very few local authorities to be cracking down on blue badge fraud is Manchester City Council: Council environment spokesman Coun Richard Cowell said: "When motorists are found to be abusing the scheme with no regard for genuinely disabled badge holders being able to park the council will not hesitate to prosecute them." - as in this case. 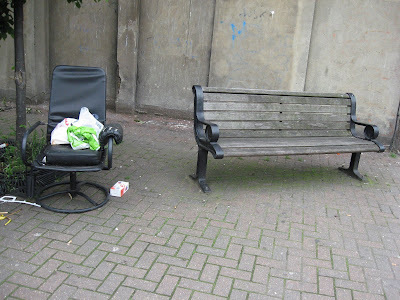 Anti-social behaviour caught on camera!